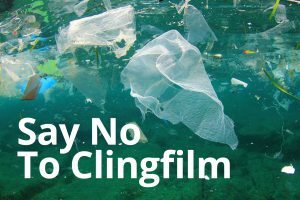 Cling wrap (Plastic wrap) is not only bad for the planet, it is bad for your health. What is the threat to human health? “New evidence suggests that heat makes chemicals in plastic storage boxes and bottles leach into food and drink: two major reports last year linked 175 compounds to health problems connected to cancers, fertility and foetal development. How does cling film impact on the environment? Like other non-recyclables, plastic food wrap ends up on landfill at best, and as litter on land and in the sea at worst. On landfill it will sit and possibly leach its chemicals for years, not degrading, and elsewhere it will do the same, whilst also being a risk to wildlife or fish who may get caught up in it or eat it. Use a cake tin for storing cakes, muffins, biscuits, etc. Have a look for beeswax covers, you might be able to purchase them in your area – they make a great gift! Beeswax wraps are made by infusing pieces of cotton with a mixture of food-gradebeeswax, pine rosin and oil, usually jojoba or coconut. The waxy coating makes the cloth waterproof, but breathable. While you can make wraps without the rosin, it's the key ingredient that makes them “sticky”, like plastic wrap.